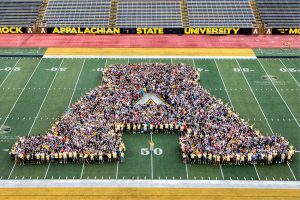 The 2018 Appalachian State University Homecoming Parade will take place on Friday, September 28th, at 6:00 p.m. The parade will travel through the campus of Appalachian State and along King Street in downtown Boone. Visitors to downtown will be able to park in any of the Town of Boone public parking lots, or on King Street. After 5:00 p.m., guests may also park in the Human Services Center parking lot, which is just a short walk to the parade route and downtown amenities. For optimal parking and parade-viewing sights, officials recommend to arrive in downtown no later than 5:15 p.m. Streets will close just prior to the parade step off at 6:00 p.m. All traffic lanes through downtown will remain open until that time.